I never thought it would happen. Yesterday, a woman was elected to lead my denomination. 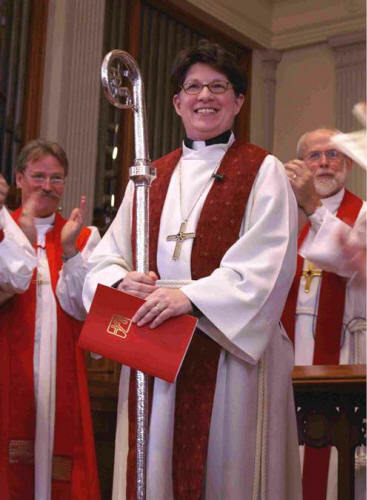 I’m a pastor in the ELCA, ordained for over 11 years now, and while I have seen several women come and go as bishops of the smaller regions called synods, I really thought it would be years, decades even, before a woman would be considered for the top post of Presiding Bishop. It was an emotional day for me. The news was unexpected – it came via text from a parishioner (thanks, Marty!) and interrupted the very important administrative tasks I was trying to finish. And then Facebook exploded with comments from friends and colleagues, all of us celebrating and wondering how we got here and what comes next. I found my heart racing and my mind buzzing and I started to feel different about my call. Honest. There was a shift in my perception of myself as a female pastor. Just because I saw someone who looks like me with the screen showing the tally of votes in her favor. I am so filled with hope about our Church. Having a woman at the helm makes a difference. I’ve experienced the shift every time I’ve been the first female pastor at a church. I’ve heard the gratitude expressed by so many people – women and men – who take note of our different leadership style and approach to ministry. I’ve seen my colleagues take on huge challenges and bring new health and vitality to struggling congregations. And knowing that our entire denomination, the Evangelical Lutheran Church of America, is going to be shepherded by a woman – I am certain that change is coming!